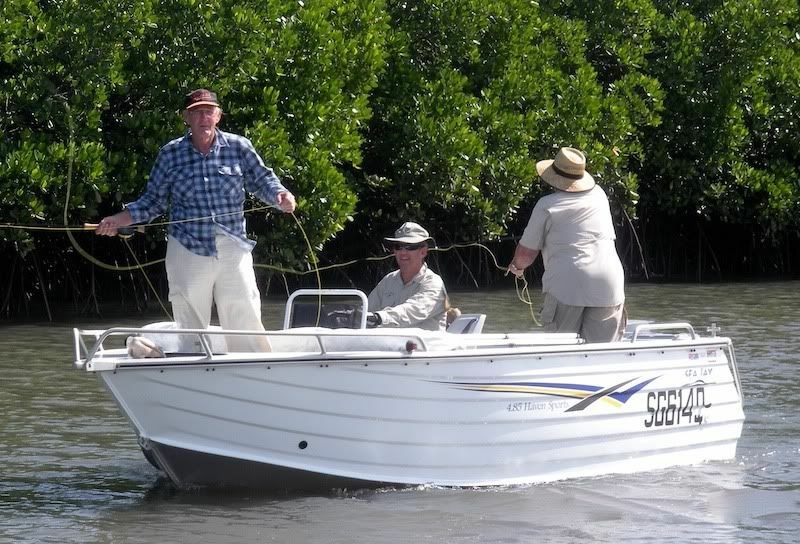 This weekend saw the NQFlyfishers first weekend trip to the Hinchinbrook Channel. It turned out to be a great weekend with 7 guys fishing out of 3 boats on Saturday and 6 guys were on the water on Sunday. We knew we were always going to be fighting an uphill battle with the 50cm of run between the morning low and the afternoon high, but with a lot of faith and a little bit of determination we headed out in the morning to froth the channel to foam. Saturday was a tough day to fish, but we still managed to land 4 species between us. Richard S, Ray and Steve went fishless, but did miss a barra boof in the morning and followed a school of salmon for a while. Their day was apparently quite relaxed crusing around drinking tea and taking photos of a place that these guys hadn't seen much of before. 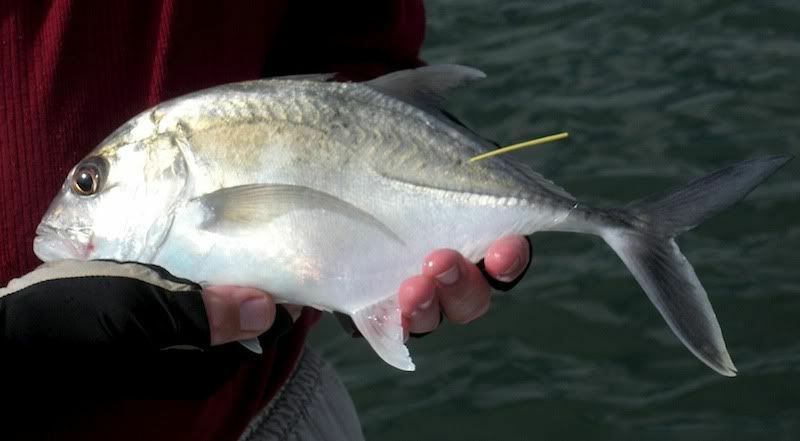 Richard W and Ward started out on the Flats, and they did see one or two fish, but were unable to convince the fish (permit and golden trevally I believe) to eat. However, after their slow start, they moved into the snags and their efforts won the day landing a total of 4 trevally, 1 queenfish, a barracuda and even a flathead by the time they pulled up stumps. After a promising start Bob and my day was a frustrating, even though enjoyable one. I managed a nice little queenfish early in the piece and Bob got blown away by what we picked as a "monster jack". We fished everywhere that looked like there would be a fish but to no avail, we missed out on the only other fish we saw... a school of small GTs. Sunday morning saw 3 boats head out again. Ward and Richard W spent a couple of hours on the flats, sight casting unsuccessfully to a number of permit and golden trevally. Ray and Richard S again spent the morning cruising and play the part of scholarly gentleman... and Bob and I had another frustrating day, this time punctuated by a couple of nice fish. We found a snag early that produced a number of good strikes, and while I missed the hook-ups on a couple, Bob managed to land himself a little queenfish to open his weekend's account. I learnt that I need to tie more effective weed guards, and only succeeded in a staying hooked to a barracuda. 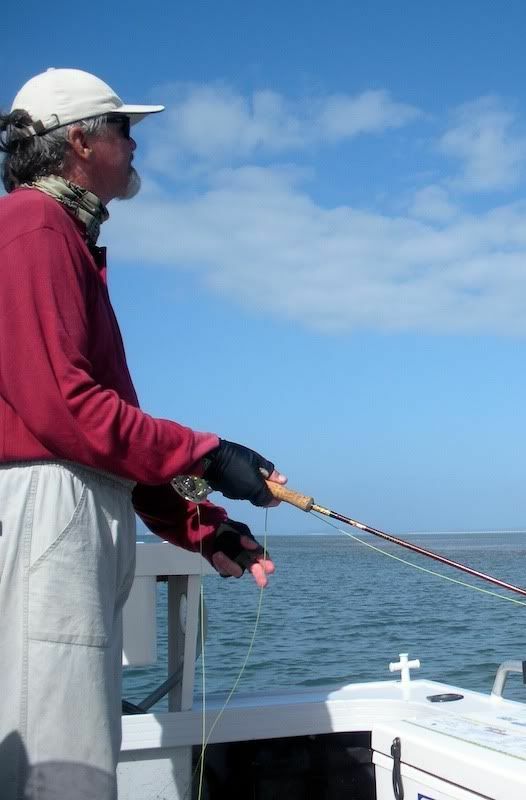 Bob continued peppering the snags with pinpoint accuracy and was rewarded with a couple of nice trevally, a black spot cod and an archer fish. To finish the day we headed up stream to find some barras, but alas it wasn't to be. 7 species on neap tides isn't a bad effort, and I can't wait until next year on a slightly better tide!